I think that could be a some type of Chevrolet. On the car is written "Tissu Garanti Boussac", advertisement in Frence for good tissues. I Think they were sold in Paris by Henri Caen & Fréres on the Rue st Denis a Paris France. I think it's a French car. JE PENSE QU IL SAGIT D UNE BASE RENAULT 2,5 t.
I agree with Jeroen. 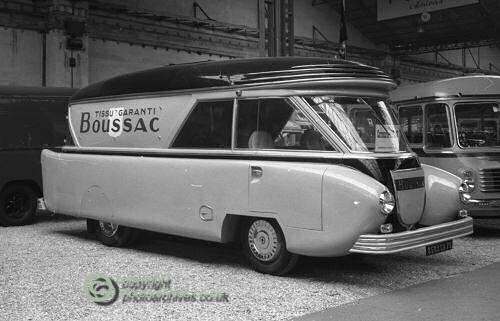 It was very common in France in the 50s and 60s to have individual car bodies on delivery vans for better marketing. 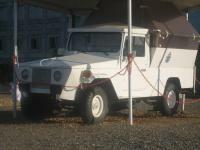 Such cars were often based on the Citroën H platform (HY, HZ, HX, HW, 1600, see https://en.wikipedia.org/wiki/Citro%C3%ABn_H_Van). Position of doors front grill and wheels position and size would fit. But it probably may also fit to similar van models from Peugeot or Renault. Axel is very close. He may even be right, but seeing the double rear tyres I think Guy wins the price. This must be a Renault Galion.